We left Bryce Canyon early in the morning to drive to Capitol Reef NP. 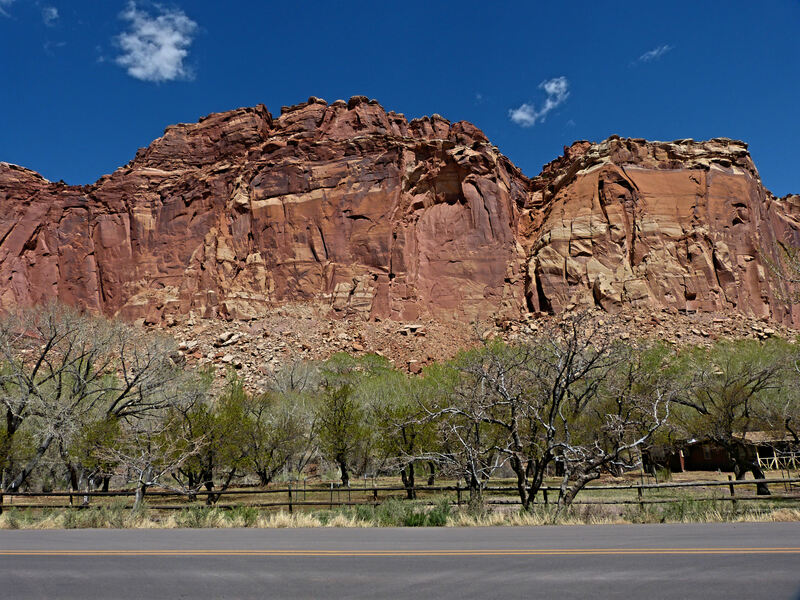 We wanted a campsite in the park, and only Fruita CG was open and sites were on a first arrival basis. We took Rt 89 to avoid some of. The steeper grades on Rt 12, after all, the Winnebago weighs some 10,000 lbs and we want to protect the brakes. The drive along 89 was magnificent, then we hopped onto I 70 for a quick 40 miles and arrived at the park in time to secure a lovely site, #10, for the night. Apple trees in fore front. Our site was on the Fremont River and had other campers on one side only. Woolly Bear enjoyed wading in the river and walking the trail to the picnic area. The only wildlife spotted were some rather tame deer and, of course, bluebirds and ravens. 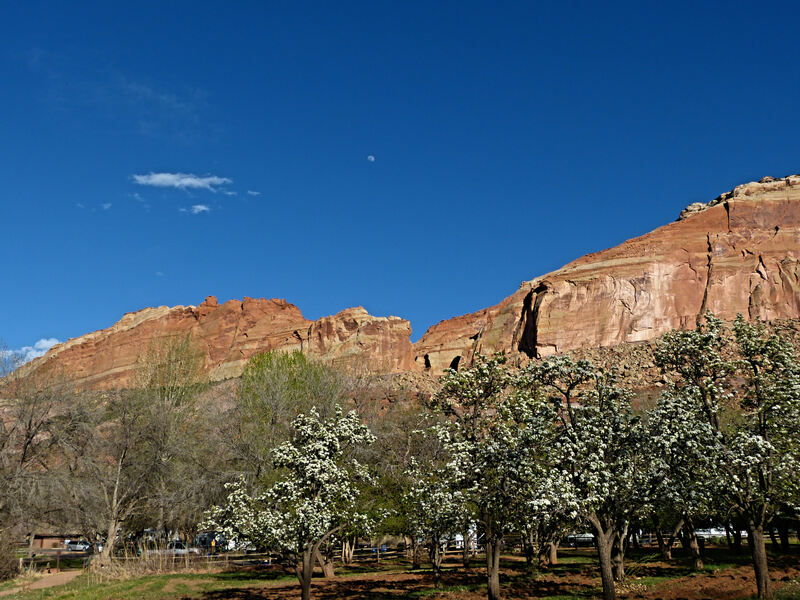 The park consists of a fertile valley and river surrounded by a sandstone canyon layered in yellow, ivory, and lavender. The rocks were deposited by an ancient inland sea and have been worn by subsequent erosion. This is one of the least visited national parks in the nation, far off the beaten path. Yet I loved it! Perhaps it was the relative solitude, or the apple orchards in bloom reminding me of home, but I would have been content to stay for a much longer period of time than Charlie! The history of the place is everywhere: ancient Fremont Indians, Mormon pioneers, and other hardy souls. We visited the Fremont Indian Petroglyphs, spent time in the Fruita Historic District, and bought cinnamon buns at the Gifford Farmhouse and Museum. In a way it reminded me of Cady’s Cove in the Great Smokies NP, much history and evidence of hardship over come by the early settlers. One rather neat place was the old blacksmith shop with exhibits of old tools, farm machinery, and harnesses dating from the 1800’s, as well as Fruita’s first tractor. During the fall harvest campers are allowed to pick the apples, peaches, and pears in the orchards. There was plenty of hiking available, but the weather was quite warm and we did not want to leave WB in the camper. 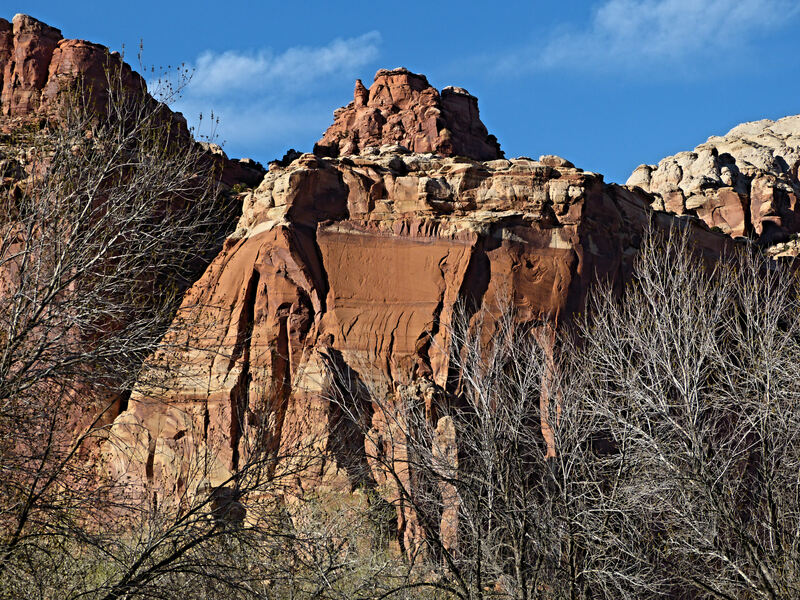 While we only spent a day at Capitol Reef, I think I will return sometime with a comfortable chair and a stack of good books. This entry was posted in Uncategorized on April 13, 2014 by Ramblin' Rose.